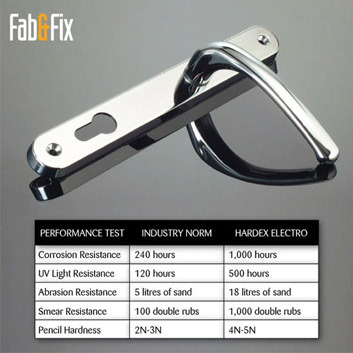 All of our doors are fitted with the The Fab & Fix ‘Hardex’ range as standard an elegant and conventionally styled furniture range which is in a choice of chrome, gold or black electro colour finishes which are applied to every part of the hardware to provide an extremely resilient finish. The range is includes everything that is required to furnish your door not only handles but also the 2D adjustable flag hinge and the Horizon multi point door lock operated by a UAP cylinder and complete with cylinder guard and letter plates, knockers and numerals. 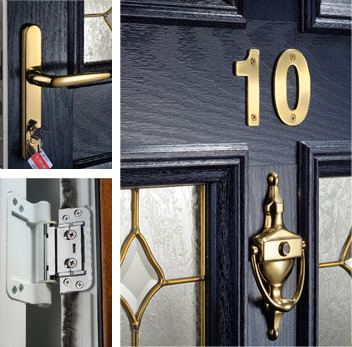 The latest evolution in door furniture is Stainless steel external door furniture manufactured from 304 grade stainless steel which comes with a10 year anti corrosion guarantee, Our new stainless hardware styles include polished gold and chrome finishes on handles, letter plates, knockers and numerals. 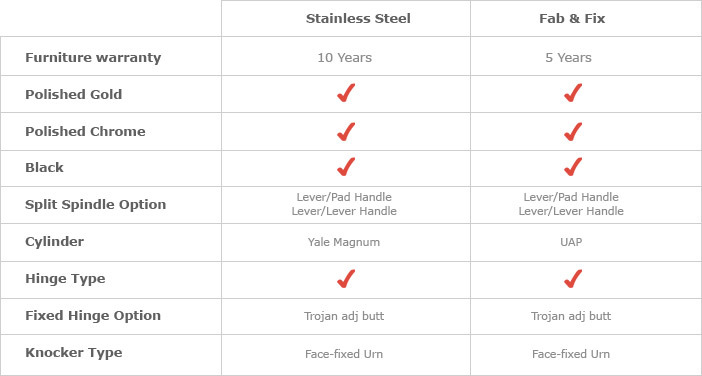 All of our new range of hardware has been tested to the most stringent of standards the lever/lever and lever/pad handles to 50,000 cycles and the letter plate which opens to 180 degrees is tested to 100,000 operations to ensure that it will operate successfully for its entire life cycle.